Today is March 3rd and that means today is the official release date of the Marvel Avengers: Infinity War toys which includes all the LEGO Marvel Super Heroes sets. LEGO is also having some promotions going on for only this weekend including the Roy Lim art print (5005573) with purchases of $25 or more and The Guardian’s Ship (30525) polybag with purchases of $75 or more. 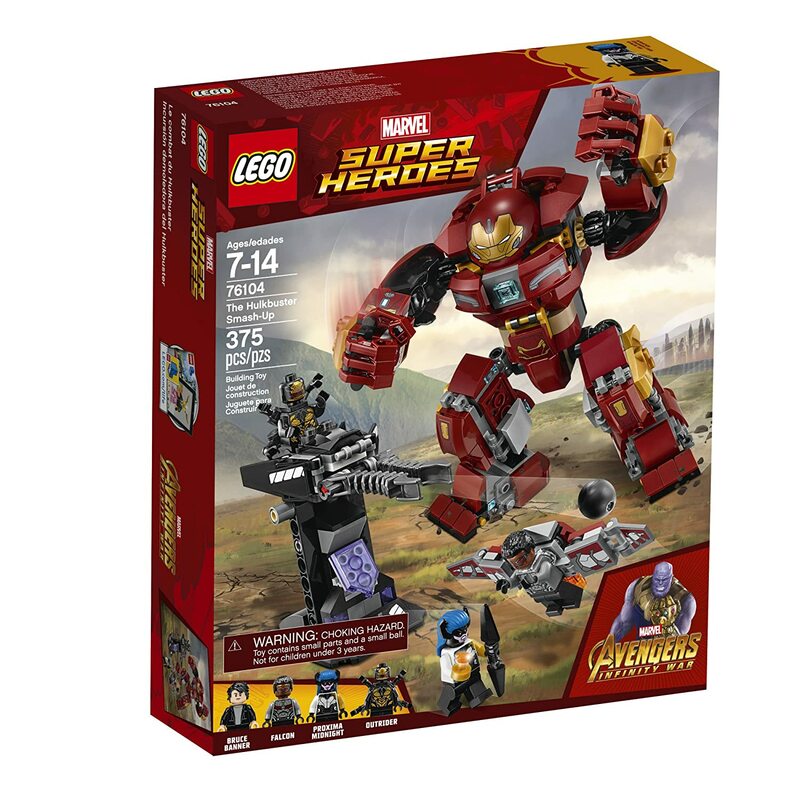 If you don’t care about these promos, Amazon also has the Infinity Wars sets available as well. 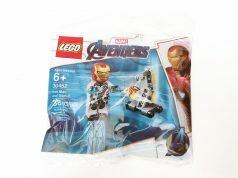 -Includes 4 minifigures: Captain America, Black Widow and 2 Outriders. -Dropship features an opening dual minifigure cockpit with the Infinity Stone element on a stand, foldout sides and 2 stud shooters. -Weapons include Captain America’s 2 Wakandan Shields and Black Widow’s 2 batons. -The new-for-March-2018 Outrider minifigures each have 6 arms. -Dropship measures over 4” (12cm) high, 2” (7cm) long and 2” (6cm) wide, and 1” (4cm) high, 7” (19cm) long and 9” (23cm) with sides folded out. 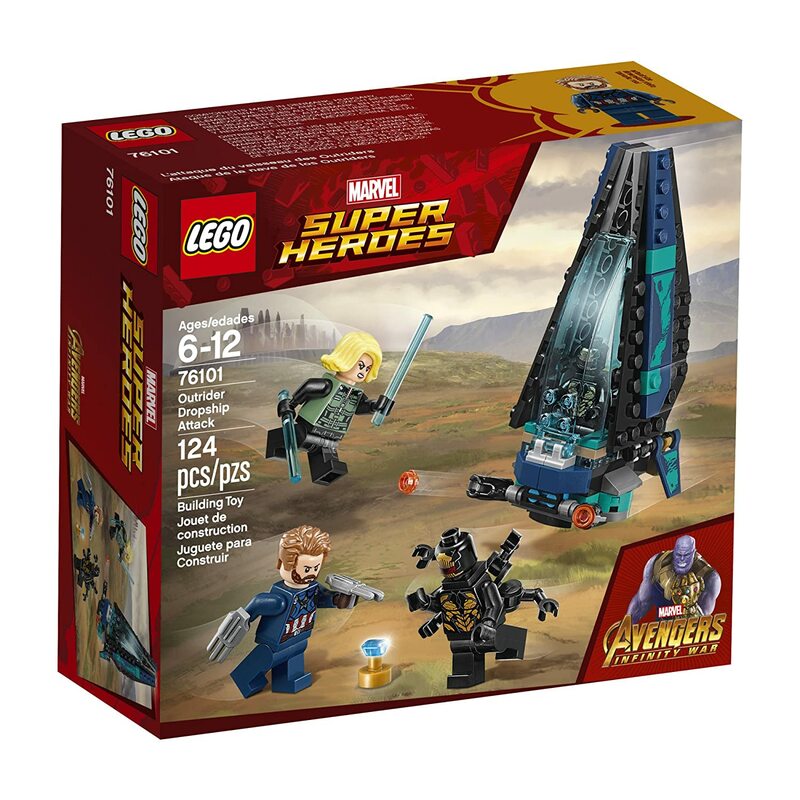 -Includes 3 minifigures: Thor, Rocket and Groot (new-for-March-2018 teenage version). -Escape Pod features an opening cockpit, detachable roof and 2 stud shooters. -Open the cockpit’s front and rear windshields and lift off the roof to place all 3 minfigures inside. -Space station features a cosmic power source, 2 energy coils, weapon reveal function, and the Infinity Stone element and stand. -Includes Rocket’s gun and Groot’s extended vine arm element. -Also includes 10 assorted translucent-blue Power Burst elements to customize your builds and minifigures. 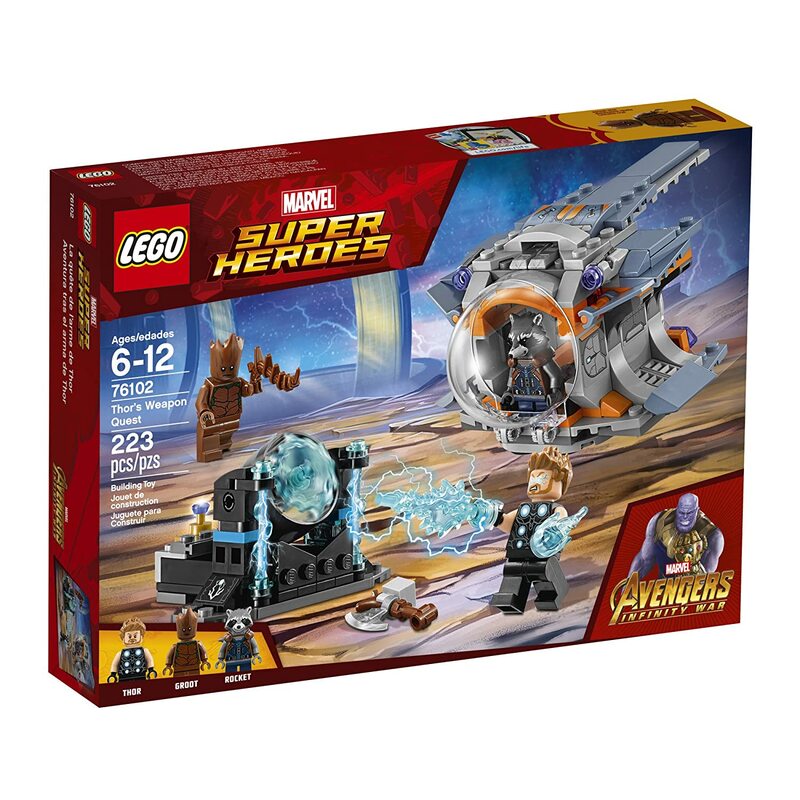 -Escape Pod can be connected to The Guardians’ Ship in 76107 Thanos: Ultimate Battle. -Recreate thrilling scenes from the Marvel Super Heroes Avengers: Infinity War movie. -Escape Pod measures over 2” (7cm) high, 5” (13cm) long and 4” (11cm) wide. -Space station measures over 1” (5cm) high, 2” (7cm) wide and 3” (8cm) deep. 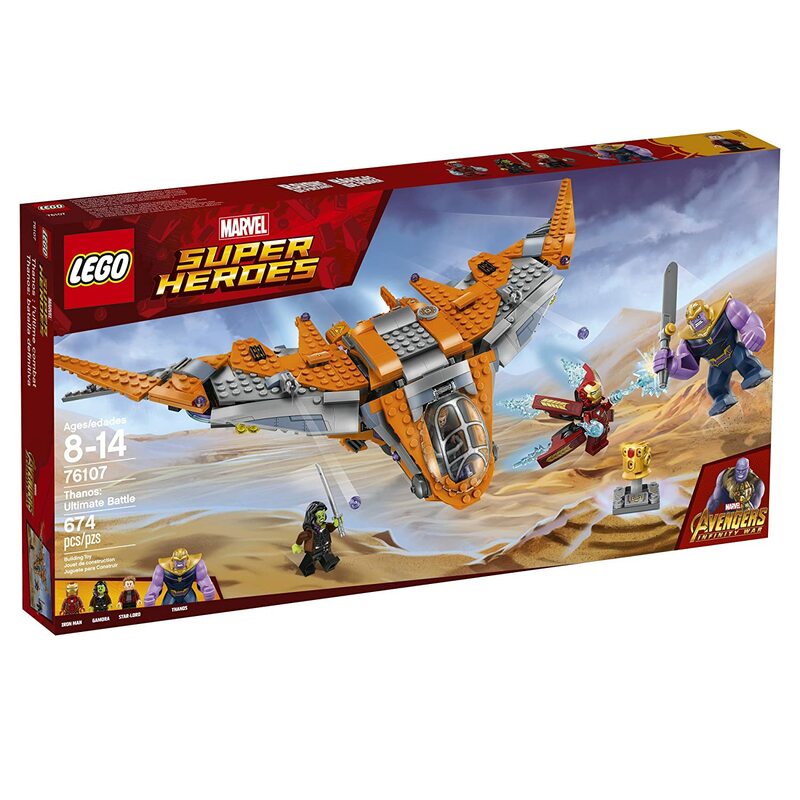 -Includes 5 minifigures: Vision, Shuri, Black Panther, Corvus Glaive and an Outrider. 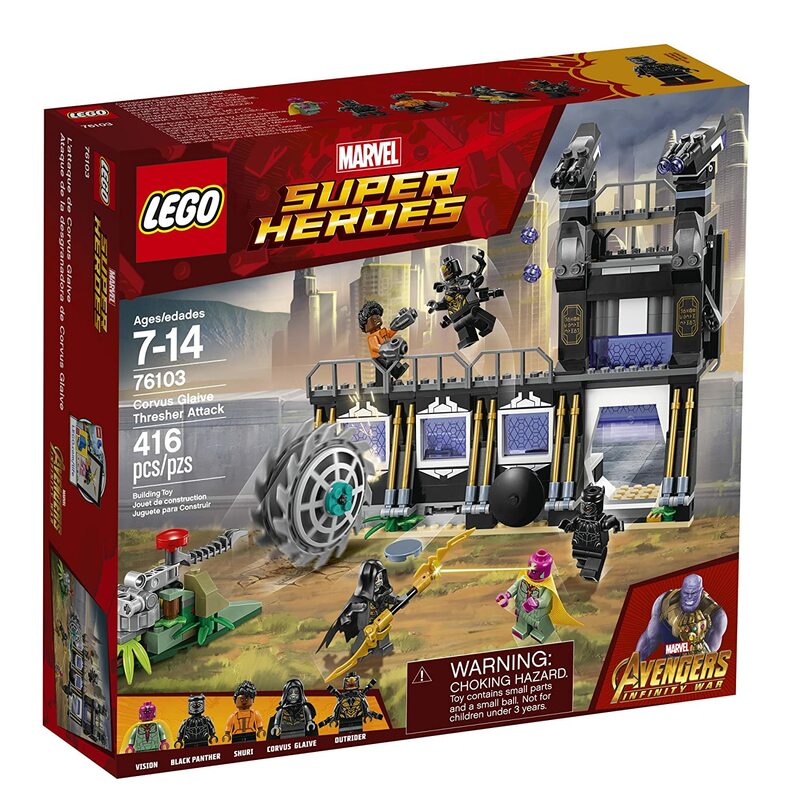 -Wakandan wall features a lever-operated opening gate, tower with 2 rotating, dual stud-shooting turrets, hidden disc shooter, hinged wall section, Wakandan lab with minifigure seat, desk and 2 computer screen elements, flip function and the Infinity Stone element. -Also includes a Thresher and Thresher launcher with trigger and jungle camouflage elements. -Aim the Thresher at the wall to activate the lab’s flip function. -Weapons include Shuri’s 2 gauntlets and Corvus Glaive’s staff. -The new-for-March-2018 Outrider minifigure has 6 arms. -Attach multiple sets to each other to expand the Wakanda wall. -Wakandan wall measures over 7” (20cm) high, 9” (25cm) wide and 3” (9cm) deep. -Thresher launcher measures over 1” (5cm) high, 3” (8cm) wide and 4” (12cm) deep. -Thresher measures over 2” (7cm) high, 2” (7cm) long and 1” (4cm) wide. -Includes 4 minifigures: Bruce Banner, Falcon, Proxima Midnight and an Outrider. -Hulkbuster features an opening minifigure cockpit, wheel-operated bashing arm function and posable fingers, arms and legs. 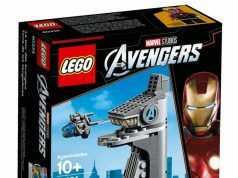 -Gun turret features a minifigure seat, ball shooter and an opening rear compartment containing the Infinity Stone element. -Includes Proxima Midnight’s spear and Falcon’s buildable wings with a detachable Redwing drone element. -Play out thrilling scenes inspired by the Marvel Super Heroes Avengers: Infinity War movie. -Hulkbuster measures over 5” (14cm) high, 2” (7cm) long and 6” (16cm) wide. -Gun turret measures over 3” (8cm) high, 4” (11cm) wide and 1” (5cm) deep. 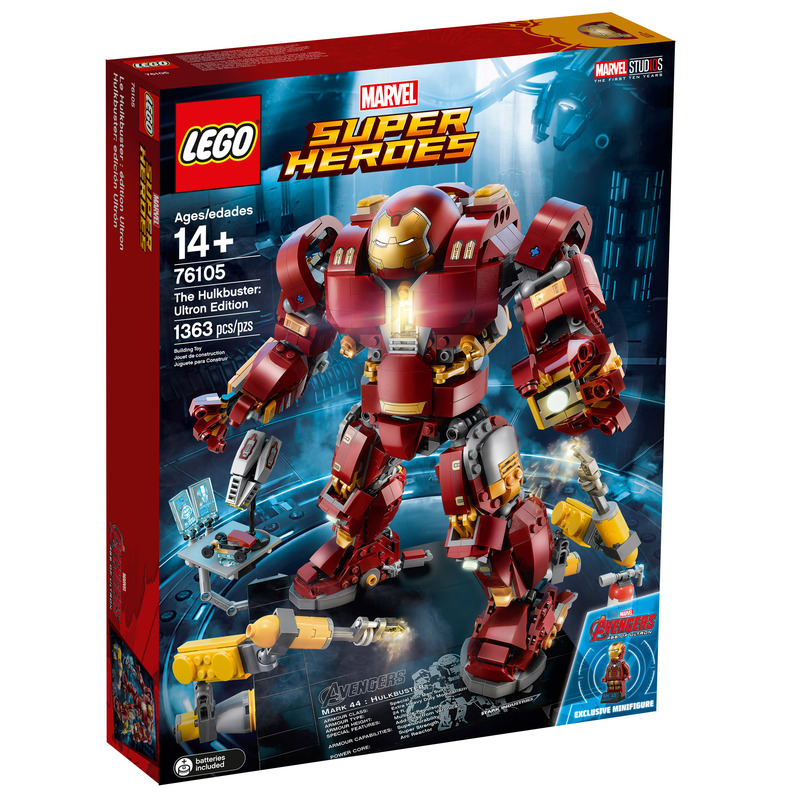 -Includes a new-for-March-2018 Iron Man Mark 43 minifigure. -Platform features a flip-up Hulkbuster information plate, plus 8 alternative attachment points for 2 posable robotic construction arms and a desk with 2 attached computer screen elements and space for the buildable hotrod car and buildable Veronica satellite. -Clip the spare Hulkbuster arm to either of the robotic construction arms for neat display. -Also includes a fire extinguisher element. -This superhero toy is suitable for ages 14+. -Hulkbuster measures over 9” (25cm) high, 3” (10cm) long and 8” (22cm) wide. -Platform (without attachable arms/desk) measures over 7” (19cm) wide, 8” (21cm) deep and under 1” (2cm) high. -Includes 3 minifigures: Iron Man, Star-Lord and Gamora, plus a Thanos big figure. -The Guardians’ Ship features an opening cockpit for the space scooter (and 2 minifigures sitting on the scooter), flip-up windshield, opening rear compartment with 2 minifigure seats, removable roof and space for the Infinity Gauntlet and stand, 2 stud shooters, adjustable wings and a connection point for the escape pod (featured in 76102 Thor’s Weapon Quest). -Space scooter features 2 minifigure seats, attachment points for Star-Lord and Gamora’s weapons, and a detachable sword. -Thanos big figure comes with a gold-colored Infinity Gauntlet (with attachment points for the included Infinity Stone and 5 other collectable Infinity Stone elements), gauntlet stand and a sword. -Replace Thanos’ left hand with the Infinity Gauntlet. -Weapons include Star-Lord’s 2 laser guns and Gamora’s sword. -The Guardians’ Ship measures over 3” (9cm) high, 8” (22cm) long and 18” (46cm) wide. -Space scooter measures over 1” (5cm) high, 1” (5cm) long and under 1” (2cm) wide. -Infinity Gauntlet and stand measure over 1” (4cm) high, 1” (3cm) wide and 1” (3cm) deep. 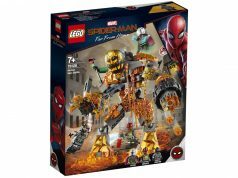 Stage a LEGO® Marvel Super Heroes 76108 Sanctum Sanctorum Showdown between Iron Spider-Man, Iron Man and Doctor Strange and the super villains. 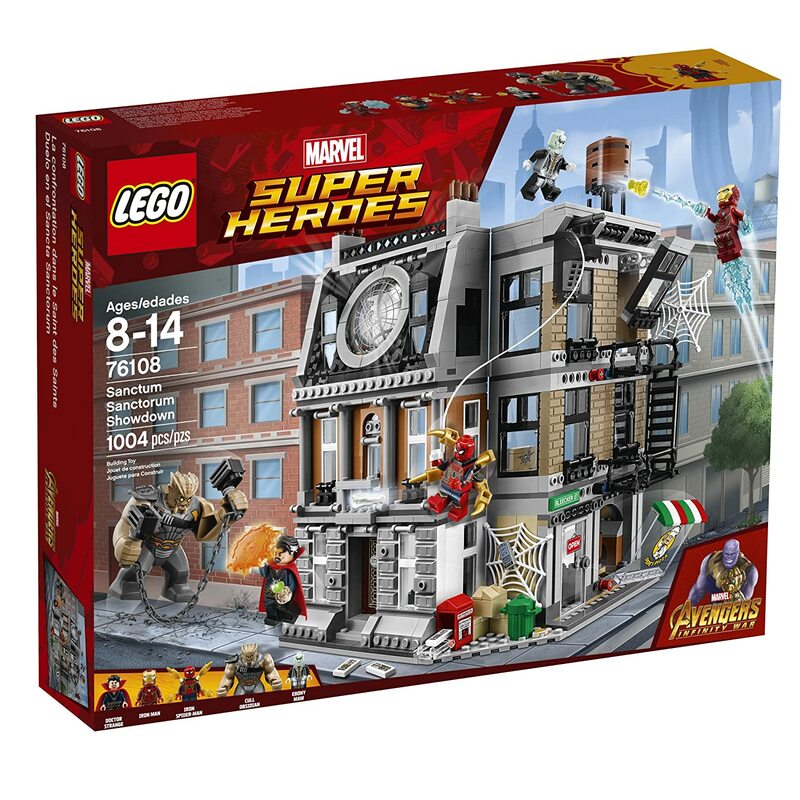 This all-action set features a foldable, 3-level New York City building including Doctor Strange’s Sanctum Sanctorum, with an exploding wall function and hidden Infinity Stone element, plus a pizzeria and Peter Parker’s apartment, both with exploding window functions. The rooftop has a minifigure-launch function and a water tower with minifigure-winch function for Iron Spider-Man. This superhero toy also includes a detachable street corner scene, plus 4 minifigures and a big figure with weapons and 20 Power Burst elements. -Includes 4 minifigures: Iron Spider-Man, Iron Man, Doctor Strange and Ebony Maw, plus a Cull Obsidian big figure. -This set features a 3-level New York City building including the Sanctum Sanctorum, pizzeria, Peter Parker’s apartment, 2 fire escapes, rooftop water tower, plus a detachable street corner scene. -Fold the building in or out and attach the street corner in different places for alternative formations. -Sanctum Sanctorum features an entrance hall with an opening door, weapon rack with an axe and sword, and an armchair; library with an exploding wall function, hidden Infinity Stone element and stand, bookshelves, opening chest with 2 daggers inside and weapon rack with a staff and spear; and Doctor Strange’s top-floor office with a new-for-March-2018 decorated Sanctum Sanctorum window, desk, bookshelves and buildable candlestick. -Explode the wall to reveal the Infinity Stone. -Peter Parker’s apartment features an office with a desk and assorted elements including a computer, lamp and boxes, and a bedroom with a trapdoor function, exploding window function, bed and pizza element. -Explode the window to reveal the spider web on the building wall. -Pizzeria features an opening door, exploding window function, pizza oven, buildable shawarma and assorted elements including a pizza, pizza peel and fire extinguisher. -Rooftop features a minifigure-launch function and water tower with winch function to send Iron Spider-Man in and out of battle on a ‘spider web string’. -Street corner features a newspaper stand with newspaper elements, trash can and assorted elements including a spider web with Iron Spider-Man’s cell phone and a pizza slice. -The new-for-March-2018 Cull Obsidian big figure comes with 2 buildable hammers. -Weapons include Iron Spider-Man’s Power Blast and Ebony Maw’s Power Blast. -Iron Spider-Man comes with a backplate with 4 leg elements. -Also includes 10 assorted translucent-blue and 10 assorted translucent-orange Power Burst elements to customize your builds and minifigures. -The Iron Man, Iron Spider-Man and Ebony Maw minifigures are new for March 2018. -Measures over 11” (30cm) high, 7” (20cm) wide and 8” (21cm) deep.